okay, the new winner for the Silver Hills giveaway is Born to be Vegan (comment: "Enter me please! My daughter starts grade one in the fall so I see some sandwiches in our future"). Please e-mail me at dreenaburton@gmail.com so I can arrange the mailing! Marinated tempeh that's been grilled on the bbq along with zukes and peppers. Man, we love grilled veggies! And, the tempeh was delicious too. When tempeh is seasoned and cooked just right, it is far better than tofu in taste and texture (in my opinion). 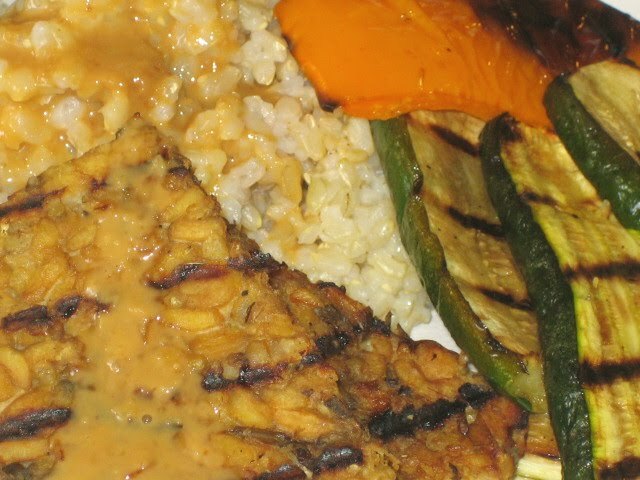 Served it with short-grain brown rice (so comforting and chewy yummy), and my "Peanut Passion Sauce" from eat, drink & be vegan . Oh, and the tempeh is also a new recipe, I just have absolutely no name for it right now! hi! i just recently found your site. i am two weeks in to becoming vegan! i'm stepping down gradually cuz the crash way just didnt work for me. so far i am really enjoying your site and esp the jonathon safran foer quote about eating misery. how appropriate! These sound delicious, as your other recipes I've tried. I recently received Vive le Vegan! and soooo love it! Thanks for sharing your ideas and recipes. enjoying the quotes from the books you're reading! Looks like I'll be reading Eating Animals soon. Hi Pammy pam (that's fun to write & say in my head)! Well, congrats on your 2-week vegan journey, and I think it's a great way to go, easing into the changes. It's also helpful to think of the dietary changes as including MORE foods (new vegan foods and products, new veggies, nuts, beans, etc) rather than what you are discontinuing in your diet. Soon enough, you become more interested in all the new foods and how great they make you feel and the 'old' foods lose their appeal. Keep it up, and thanks for 'tuning in' and dropping in with a note. Thanks Tyrah, and EA is really an excellent book, I highly recommend it!